Set in England and also in outer space, Liam has always looked significantly older than he is. He is just a kid, but looks grown up. Finally, he can use this as an advantage. He enters what he thinks is a contest to be the first into an amusement park. The only thing, the contest is open to fathers and their child. He decides to be the father and convinces his friend to be his daughter. Liam takes the role of dad quite seriously and buys a book on parenting. The entire book, he strives to be “daddly” and he is far more daddly than any of the other irritating dads trying to win the contest. This is clever and witty and good plain fun. Suspend belief and go along for the ride. The junior year of three teens in a private high school in Boston are chronicled through essays, emails, notes, faxes, thoughts and more. The essays (class assignment) are bound together to become this book. Augie and T.C. have been close friends for years and new girl in school, Alejandra joins the two in chronicling their most excellent year. Told in alternating perspectives, it is a thoroughly enjoyable read from beginning to end. Best for older teens. First off, I am disappointed the publisher changed the cover art to a picture of a real girl. Love the frog, penguin, marshmallow man. These books are more than just chick lit. The writing is so clever and characters are complex and real with plenty of wry wit and humor throughout. The series is best read in order. These are short, quick reads. Ruby is in counseling because she’s made a mess of her life and has panic attacks. This all stems from boy trouble and friend trouble. 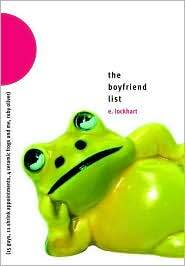 Her therapist instructs her to make a list of all of her past boyfriends and analyze the relationships. The books are so much more than that. Ruby was in with a tight group of friends, then Ruby is kicked out of the group, then makes up with them, in other books, and the relationships with boys and girls are tumultuous. Until for a while, she meets a boy who makes incredible chocolate croissants. (Try these at home by spreading Nutella on refrigerated crescent rolls – sort of almost as good.) Ruby is forever making lists – clever, fun, and addictive! Best for older teens. Winner of the esteemed Michael L. Printz Award for Young Adult Literature and also a National Book Award Finalist, this is the story of a girl at a boarding school fighting against the male-dominated school structure. The male members only Loyal Order of the Basset Hounds is known for pulling silly pranks. 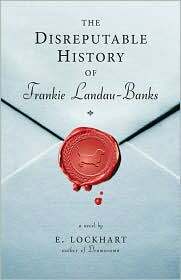 Frankie finagles her own secret membership by assuming a false online identity and begins pulling pranks of her own. The word play in this book is nonstop along with the comedic tone. 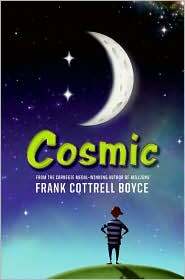 A fun book – the kind that left me smiling and shaking my head at the same time. Another book of hers to read, Dramarama – the goings on at a summer drama camp. Best for older teens. Scott is stressed out over starting high school. Sure would be easier if it came with an instruction manual. 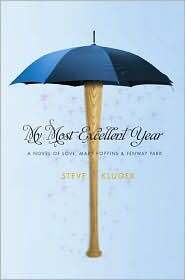 He decides to write about his high school experiences for his unborn brother. Scott is quite likable and has the same struggles and worries that so many do. Sharp and witty, cleverly written. Scott has a cool English teacher who introduces Tom Swifties to them. Examples from the book: “Who turned off the lights?” Tom said dimly. “I lost my legs right below the ankles,” Tom said defeatedly. I haven’t read anything quite like this. MacLeod is yet another brilliant Australian author. Seth comes from an eccentric family – a good, quirky kind of family. Instead of cussing, his father says, “Rude gestures!” The parents are also quite partial to singing “Moonshadow” one of Cat Steven’s hits from the 1970s. His younger brother has dashingly good looks while Seth is more tall and lanky. What cracked me up reading this is Seth’s preference for women with big muscles, “muscly girls” as in female bodybuilders. The entire book is so quirkily good. Perhaps the official summary might help describe the plot. From the CIP: As his odd parents fight the regional environmental health officer about their dung-covered house and his melodramatic younger brother demands attention, fourteen-year-old Australian Seth Parrot simply seeks the muscular woman of his dreams. Moriarty is another brilliant Australian author that I follow. These three books take place within the same school. The characters from one book will make an appearance here and there, but the books can be read independently. 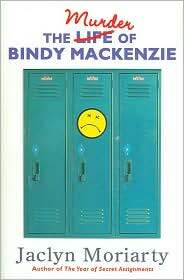 My favorite is The Murder of Bindy Mackenzie. She is the school’s smart, know it all girl to the point of being obnoxious. She is convinced someone is trying to kill her. Her fears are dismissed. Too bad – someone IS trying to kill her. This novel is told through emails, school assignments, letters, and memos. These are fun reads. Newbery award winning Perkins has written a unique book that doesn’t have a traditional plot line. It is a series of stories. Ry’s family just moved to a new town. He heads off to a summer camp via train while his parents fulfill a dream of sailing around the Caribbean with no clear time table. Ry’s grandfather will be at the house to take care of the two dogs. He gets off the train at a stop to stretch his legs, the conductor told him he had time, he walks off a ways, and pulls a letter out from the camp that he hadn’t had time to open until now. Oops, the camp is closed, don’t come. Then the train pulls out. So he is stranded with a dying cell phone. Meanwhile his grandpa takes the dogs out for a walk and has a mishap, so he isn’t by the phone to take Ry’s call. His parents are in the middle of the ocean. How does he get home? The memorable characters that Ry meets on his journey have stories of their own. The novels flips back and forth between the characters, we even get the dogs’ story.